The Department of Research Programming holds workshops on the theme of “the original” in preparation for the International Symposium on the Conservation and Restoration of Cultural Property which it will host next fiscal year. 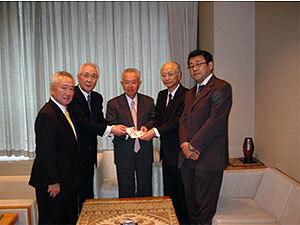 In December discussion was held with Director General Suzuki Norio who has been engaged in the restoration of cultural properties for many years. Today, the fundamental principle for the restoration of cultural properties in Japan is to conduct the minimum necessary treatment without hindering the scientific, historical and aesthetic value of cultural properties and keeping in mind the maintenance of the present condition. However, the question as to where the focus should be placed with regard to the material or the form of cultural properties or on which point in the history of a given cultural property the appearance of that cultural property should be maintained is a matter that is closely related to the fundamental question of where the essential value of cultural properties lies. It is a matter for which a standard rule cannot be laid and which requires many important decisions to be made during restoration. What was of interest was the comment that in Japan people have a unique sensitivity and sense of value that find beauty in the changes that passage of time brings to cultural properties – what is often referred to as “ageing” – and hope to transmit it. There was much active discussion since such a way of looking at cultural properties, not merely looking at them in their original but also placing focus on the value brought about by history, has something in common with the idea of “the original” that we wish to propose in the Symposium. 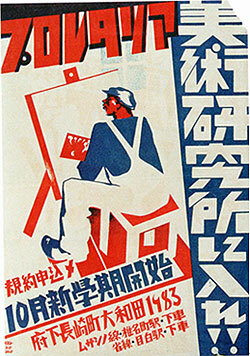 As a part of the research project “Comprehensive Research on Modern and Contemporary Art,” the Department of Research Programming is working toward the publication in fiscal year 2008 of A Study of Exhibits from Art Exhibitions of the Showa Era (Pre-World War II Volume), a collection of articles on art of pre-World War II Showa period. A workshop was held on December 27 in relation to this publication. Following is a list of presenters and the titles of their presentations. As the presentations were made by young researchers, their contents that covered such challenging, not-yet well studied fields like proletarian art, comics and design were fresh innovative and stimulating. Although most of the presenters and participants were contributors to A Study of Exhibits from Art Exhibitions of the Showa Era (Pre-World War II Volume), close to 30 researchers participated and held heated discussions based on the presentations. There is no question that this workshop served as a good impetus for the publication. Until now the fact that there are not many differences in expression or techniques between Jocho-style Buddhist statues, the standard sitting style of Amitabha Tathagata, made in the cities and in local areas was attributed to skills of the Buddhist sculptors who made these statues. 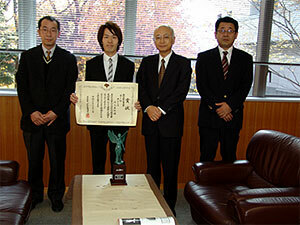 Instead, Tsuda attributed the lack of difference to the way in which theses statues were produced. He noted the existence of local officials who had bases of their activities in both cities and local areas and who moved between the two. By so doing, and by giving directions as to how statues were to be made, they acted as key persons in the production of Buddhist statues and raised the cultural level of the local areas to that of the cities. Based on such hypothesis, Tsuda examined the statue of Amitabha Tathagata at Jogon’in temple in Shiga prefecture whose original canopy, nimbus and pedestal remain and other similar statues in nearby temples. The presentation was followed by active exchange of opinion among the participants, including indication of places where further study seems appropriate. 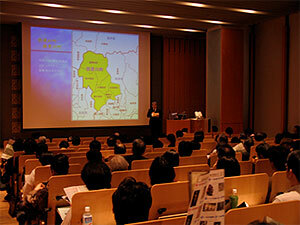 The Department of Intangible Cultural Heritage held a public lecture on December 12, 2007 at the National Bunraku Theatre in Osaka. Hoping to choose a theme appropriate to Osaka, the place where the lecture would be held, it was decided to choose Hayashiya Tomi (1883-1970) who was designated in 1962 as a player of kamigata yosebayashi (music played in rakugo of the Kansai area), an intangible cultural property for which measures for documentation should be taken. 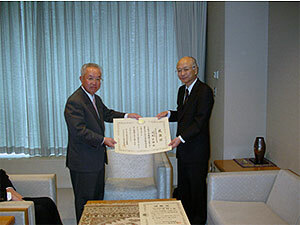 Details of the program can be retrieved from the web site of the Institute (http://www.tobunken.go.jp/ich/public/lectures). 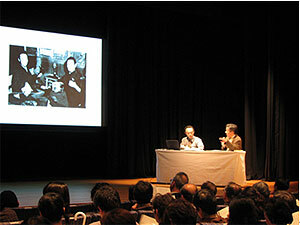 If the public lectures given from the days of the former Department of Performing Arts are counted, this would have been the 38th one, but this is the first time that the lecture was held outside Tokyo. In the future we hope to hold such lectures throughout the country. Last year the Department of Intangible Cultural Heritage held a conference to discuss issues related to the protection and transmission of intangible folk cultural properties. 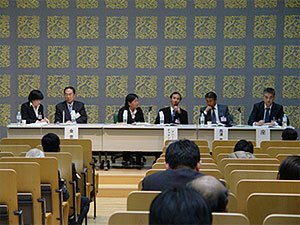 The second session of this conference was held on December 7, 2007 in the Seminar Hall of the Institute. The theme for the 2nd Conference was “Merger of municipalities and the protection of intangible cultural properties.” Among the many types of cultural properties, folk cultural properties are most likely to be influenced greatly by merger since they are transmitted and protected within the given region. Presentations were made by municipalities that have recently experienced merger and municipalities that have succeeded in using the merger for the protection of their intangible folk cultural properties. These presentations centered on such matters as the systematization of preservation activities and collaboration with school education and were followed by overall discussions. 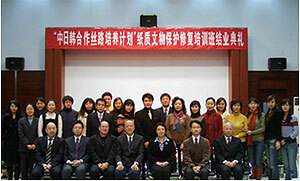 The content of this conference is scheduled to be published in March 2008. 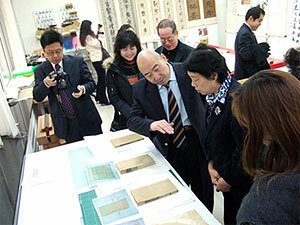 Many people from Japan and overseas visit the Institute to see its facilities. 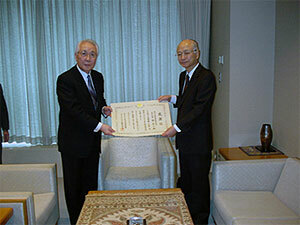 In recent years, visits by junior and senior high school students are increasing. In December, approximately 20 students each from the Shinagawa Joshi Gakuin High School and Masuda High School in Shimane prefecture visited the Institute. At the former conservation science section of the Center for Conservation Science and Restoration Techniques, Inuzuka explained the characteristics of stone and soil as well as the calculated temperature changes in the Takamatsuzuka Tumulus in order to determine the method for cooling its tumulus mound. Yoshida explained X-ray fluorescence analysis which is used for non-invasive analysis of colored materials and its application on research of paintings. 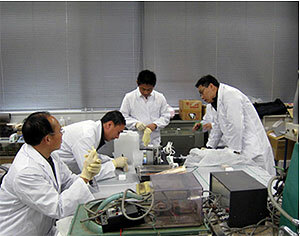 Since the content of the explanation was applied scientific, it may have been a bit difficult for high school students. However, in today’s society where there is a trend away from science among the young, it is hoped that their experience at the Institute may have helped in making them see how such studies as physics, chemistry and biology are applied in the field of conservation. 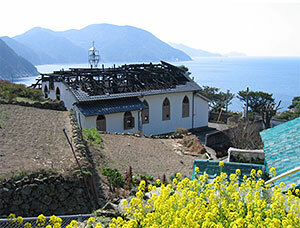 On request from the Board of Education of Nagasaki prefecture, an on-site investigation was conducted of Ebukuro Church at Shinkamigoto-machi, which was damaged by fire in February 2007, and advice was given concerning its restoration. Ebukuro Church, a one-story, tile-roofed, wooden structure, was built in 1882 and is considered to be the oldest wooden church in Nagasaki prefecture. 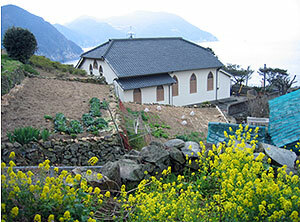 It stands on a steep mountain side overlooking the ocean. With its single-layer, modified hopped roof construction, it is also considered of value from the point of view of structure. However, the building was destroyed by fire, which was caused by a short circuit, in February, 2007. 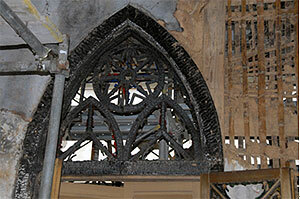 Rather than rebuilding the entire church, the local parishioners expressed their wish to save as much of the structural members that could be reused as possible. The Center for Conservation Science and Restoration Techniques conducted on-site investigation and gave advice on restoration, which included impregnation of synthetic resin to members that could be reused because of comparatively less serious damage.